That’s right – today I’m answering questions that get asked in the comments. You say, “Tell me some more!” So I do. We’ll start with Emma, bringing my attention to something … interesting. This is Emma. Say hi to Emma. 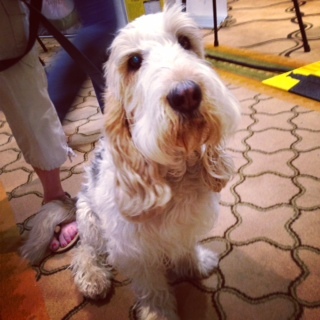 She’s a GBGV with a beautiful, soft coat and a taste for wabbit. Did you see slimkitty.com today? The Bert with Jones Pork Femur bone photo is featured 😉 Darn cat! Not just one dog in the car, but TWO dogs in the car! What an irresponsible driver! 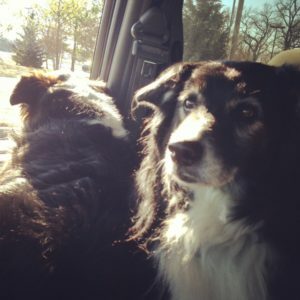 Jodi, at Heart Like a Dog, responds to yesterday’s post about keeping your dog cool, specifically not leaving the dog in a parked car in any kind of heat. I can’t believe we still have to tell people this. I really hate going to the stores at this time of year, because without fail I park and I hear a dog bark and then I freak out. When will people learn? I know. It’s horrid. I can’t see myself breaking out any windows, but I can see myself calling the police or animal control. I think I’d probably try the doors first, actually. I leave my dogs in the car in fall and spring, windows half down, when the temps are in the 50’s and 60’s, and don’t lock the doors. I figure if someone wants my car badly enough to risk two 50 pound barking dogs, they can have my car. The dogs will take their faces off first. So far, in all my years in Tulsa, I haven’t come across dogs in cars in summer. People parking in fire lanes in front of stores and going in to shop are a whole ‘nother story. Grr. 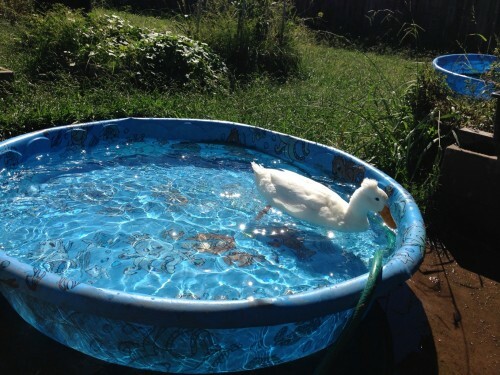 Did you go get a new pool for this photo, my duck pools don’t nearly look that good. I took this photo last summer when I found a wading pool for free on Craigslist. You can see the old pool in the background – it had sprung a leak. Having only one duck, Jimmy doesn’t do too much damage to his wading pool anyway. So yes, this is technically a new pool at the time this photo was taken. Oh, puppies…they really test us, don’t they? Just when we think we’ve done a bang up job of puppy proofing everything – they always find something we’ve forgotten! OMD – you’re so right! Chewy has been stellar all week, playing nicely with the baby (I have family in town), not nibbling on the toddler, being far less destructive. So Hunny and I went out last night, just the two of us. Came home to toilet paper EVERYWHERE. Everywhere. Living room, dining room, hallway, bedroom floor, our bed. What a mess. And Chewy was so proud of his decorating skills. All I could do was laugh. Y’all, that’s it! Have yourselves a great weekend! Pick up some Jones Natural Chews for your dog, just to see it smile. I know I’m going to. See you on Monday, when we always have funny dog videos, designed to bring a smile to your Monday face!